I had the high score in Week 2. Jim was closest to the random mystery score. 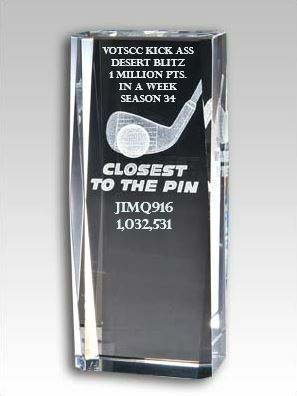 Jim had the high score in Week 3 and grabbed the lead for the season. Ron was closest to the random mystery score. Jim had the high score in Week 4 and Ron was closest to the random mystery score. I had the high score in Week 5 and picked the season title. Gene was closest to the random mystery score. I will be travelling next week. So I'm putting the course list out a little early for next week. Just add your score next to your name please. Thanks! Feeling a bit weak in the scores but enjoying the competition! @faasda01 wrote: Thanks! Feeling a bit weak in the scores but enjoying the competition! Scores will come, try to make your goal hitting all 9 greens. 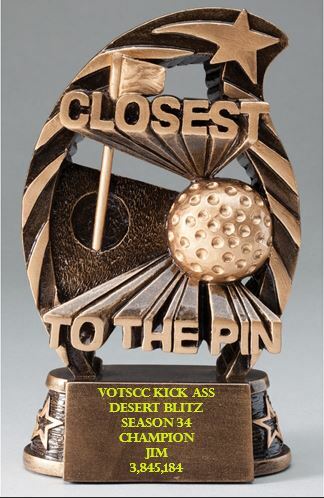 There are holes that I will play a safer shot that hits the green rather than aiming at the hole. A lot of the high scores you see are result of repetition, some of us have been at the Blitz a number of years and holes become familiar. The important part is you're getting practice with your irons, which will improve your overall game. Good luck. Sorry for the delay in posting this season's week-by-week results and standings. Please see below. Impressive performance as Jim took the season title!!! See below for Week 5 details and Final Summary. I barely edged out Jim in Week 1. Jim was closest to the random mystery score.